← Goal Setting 101- How do you do it? Finally, in my neck of the woods it is chilly in the mornings, pleasant during the day, and chilly again at night. Here are a couple of red wines to get you in the mood for cold nights and hearty meals. My Take: This was an easy-going wine, which was a surprise for a Cabernet Sauvignon. I like BIG cabs – this wasn’t. As the label said, it’s a calm and peaceful cab, good for sipping (which is rare) and goes well with food. Is it the first bottle of Cabernet I’d reach for if I had a hearty stew or steaks on the grill? No. But it’s a solid wine – the ’09, at any rate. My Rating: ~ Drinkable ~ But nothing to write home about. My Take: Some wines deserve the “Grand Reserve” label, and others don’t. In my opinion, this one didn’t, though it was a very tasty wine, indeed. I will say I LOVED the label and it’s total lack of pretension, lol. But then, that’s par for the course for Trader Joe’s. I’m glad they are putting their own wines out. 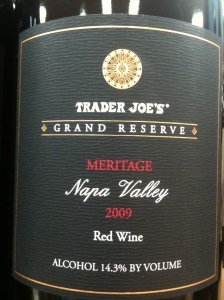 My Rating: ~ Drinkable ~ I’d have rated it higher, but that “Grand Reserve” title got to me. Heartland Stickleback Red, 2009, South Australia Alcohol 14.5% by Volume – $22 in a restaurant. My Take: Okay. Imagine this. Hubby and I are walking along in Carlsbad, headed to our favorite Italian restaurant even though neither one of us is in the mood for Italian. A cute young Aussie stops us, says they just opened their restaurant (The Australian Grill) two days earlier, and would we at least look at the menu? We did, we sat, we ate. Hubby a lamb burger, and me a beef burger. Excellent food, excellent fries, and this wine which our waitress recommended as being “very Shirazzy”, lol. The wine went very well with the food after it had some time to air. (Or maybe it was the second glass just tasted better, lol!) We sat on the patio, and true to our usual affect, we soon attracted other customers who didn’t know the place existed. My Rating: ~ Very Drinkable ~ Okay, so I’m as susceptible to atmosphere as anyone else. I’d love to find this wine locally and give it another try, to see if it is still “Shirazzy”, lol. If you try it, let me know what you think! As usual, these are my honest opinions and will depend upon my mood, the weather, and what cycle the moon is in. Your taste buds will differ. 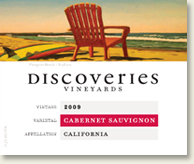 This entry was posted in Wine Friday and tagged Australia, autumn, Cabernet Sauvignon, Carlsbad, Discoveries Vineyards, Heartland Stickleback Red, kangaroo burgers, lamb burgers, meritage, red wine blend, Trader Joe's. Bookmark the permalink. Hmm, I love a good red in all its incarnations. I’ll have to look for these. Wine under $10.00. My kind of wine. Thanks for the tips. I enjoy wine but don’t really have an education in it. Your comments are witty and insightful and leave me with the desire to learn more about wine in general. I wish I had a glass of something right now. You’ve given me a craving.